For as long as there have been RPGs, there have been people making fun of RPG tropes. The Internet is sprinkled with jokes about level grinding and home invasion, to the point where Jokes About RPGs deserve their own slot on the Grand List Of RPG Clichés. So if you're going to do RPG humor, you need to do it in a unique way. And if you're going to make a game about boring RPG tropes, it'd better not be as boring as the cliches you're trying to mock. 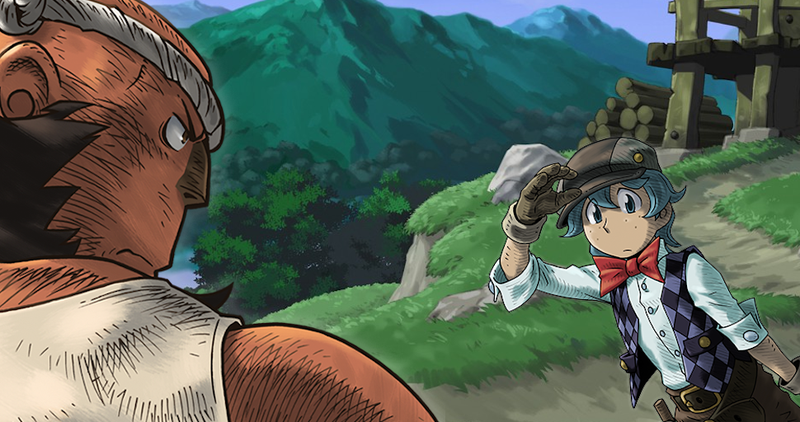 Take Weapon Shop de Omasse, a new rhythm game in which you are a blacksmith who rents out swords and spears to wandering heroes. Released for the 3DS yesterday, Weapon Shop rounds out a series of four experimental digital games that publisher Level-5 calls Guild. While the other three games were directed by experienced Japanese designers like Yoot Saito and Yasumi Matsuno, this one was helmed and written by Yoshiyuki Hirai, a Japanese comedian. The concept is this: Heroes need to save the world from the Evil Lord, and in order to go out and do that, they need weapons. You, an intrepid young blacksmith's apprentice, have to forge, polish, and rent out these weapons. To do this, you participate in a bunch of mini-games that revolve around tapping the screen a lot. You tap the screen to the rhythm of the music in order to make weapons, and then you tap the screen to no rhythm in order to polish them. You continue doing this until you win, or turn off the game. It's reminiscent of one of those DS games that developers used to make back in 2005 and 2006, before we all realized that tapping a screen over and over again is kinda boring. Rhythm games like Elite Beat Agents and Final Fantasy: Theatrhythm work because of the music, and the variety, and the increasing levels of difficulty—not because of the tapping. Weapon Shop doesn't seem to get that. Once you've made one weapon, you've already mastered the game, and blacksmithing immediately turns into a chore. Between these tedious rhythm sections you'll be visited by characters—both Important People with Names and unidentified NPCs—who love making jokes and generally being quirky. They'll ask you for weapons, and you'll have to pick the right ones for each character. Then, you'll start seeing these people go on RPG quests, and the jokes come fast and furious thanks to a social media sendup called the Grindcast—get it? Because RPGs make you grind?—that streams messages onto the 3DS's top screen. Your enjoyment of the humor may vary, depending how much you tolerate jokes about JRPGs. I laughed at a few gags, and cringed at a few more. (May the words "le angry" are never uttered by anyone ever again.) The localization is very sharp, as expected from a Level-5 production, but there's only so much you can get out of video game references and Twitter-style hashtags. It's cute, in a lot of ways, and I'd want to play a lot more if the rhythm sections weren't so tedious. As I played through Weapon Shop, I found myself dreading the act of weapon creation—which is basically all you do—and I eventually just gave up. The goofiness (and great music) aren't enough to justify the boredom. So, yes, this game's a bust. If this were an Official Kotaku Review, it'd probably get a no. But Weapon Shop doesn't work. It's just too boring. If you're looking for a new handheld game, go with Bravely Default or Danganronpa instead.